It's not my first time to be here, I've dined here a long time ago and I have to admit there wasn't really anything here that impressed me. When I had a chance to dine here again, I had no expectations and I sort of had a skeptical mind. The restaurant follows a dress code, no sleeveless shirts. flip flops and shorts are allowed. I was wearing a sleeveless shirt when I went there for breakfast but the staff were kind enough to lend me a blazer to wear. As soon as I entered, I noticed three plaques that were displayed. Cafe D Asie has received recognition from Asia Tatler Dining as one of the best restaurants in the country for 2008, '09 and '11. The interiors of the resto is really nice, the resto's area was shaped into a circle. On the center was the chandelier, on the right was the buffet spread and on the left side is the dining area. The dining area is spacious, tables are spread apart enough so that guests won't feel cramped up. I really like how the buffet spread was set up, it follows the circular shape of the resto. The best idea that I thought of to compare how the buffet was set up was it is shaped like a circular shooting target. I was introduced to Mr. Franz Eichenauer, he is Bellevue Owner's Representative. He asked me if I had dine there before, I said I had but it was so long ago that I can't even remember when. The very first things he replied was that the Bellevue has hired world class chefs to revamp the menu of Cafe D Asie for the past few years. He introduced me to Chef Martin Przewodnik, the head chef at the moment who is taskedto teach the staff on improving the food but he is really based in Bellevue Bohol. Both of them excitedly told me about Bellevue's Sunday Brunch. After our small chit-chat I was off to look at the Breakfast Buffet Spread. At the 'bull's eye' table, there were an assortment of freshly baked bread and pastries which I was informed were made and baked in-house. At the next inner 'target' circle was the different assortment of cooked foods, the fruit station, the cheese station, the yogurt with preserved fruit station and the cold cuts station. At the outermost 'target' circle was the salad and soup station. The egg station, where you can tell the chef how you like your eggs. The dimsum and dumpling Station. The cereal and milk station. The juice station which offers 3 varities of juice, Mango, Apple and Orange. The fried section station which had different kinds of Daing or fried dried salted seafood and Bacon Strips. Guests can heat their bread in this revolving toaster. Upon being seated, the server asked if I wanted coffee or hot cocoa, I wanted coffee. When my cup came, it looked so promising, it had a thick crema on top but I was disappointed when I took a sip. The coffee was made well but it lack the strong black flavor I was looking for. I do hope they change the brand or supplier for their coffee. Making room for Sunday Brunch, I got a few stuff from the breakfast spread. My breakfast plate consisted of a Yogurt Cup, Slices of Oranges and Melon, a Piece of Parmesan Cherry Tomato, Bacon Strips, a Cherry Danish Pastry and a Croissant. Everything on the plate was prepared and cooked well, the fruit slices were fresh and sweet, the bacon strips was deliciously crunchy and the pastries were nice and flaky. I had two perfectly cooked sunny side up eggs with a runny yolk that I requested from the Egg Station. I also had a really nice and simple Miso soup, it tasted how it is supposed to be and I particularly like how silky soft the tofu was. Judging from the breakfast buffet spread and quality of the food, the buffet breakfast would easily cost more than 1K. I was so surprised to find out that it only cost Php770 net per person, this was such a great deal. After a couple of hours, I went back dressed in the proper required attire. The simple and hearty breakfast buffet spread has turned into a scrumptious looking brunch buffet. I was greeted by Chef Martin and he recommended the the must-try areas and dishes that I should taste. I went around to take a look at the different stations of the brunch spread. There was the Japanese station, it offers a variety of Sushi and Sashimi, Cold Soba Noodles, Tuna and Kani Salad and Baby Octopus in Pepper Sauce. The Select and Grill Station offers different fresh seafood and meat of your choice to be grilled right on the spot. The pasta from the Pasta Station was one of the highly recommended dishes that Chef Martin told me. There were three choices of pasta and sauce that guests can choose to mix and match. And to my delight, the station also serve fresh baked Pizzas. I was surprised to find a Mongolian Station, it's been a while since I saw something like this. The Cold Cuts Station offers Smoked Milkfish, Prawns, Mussels, Smoked Salmon and a Mango Shrimp Cocktail. The Tempura Station has Shrimp and Squid Tempura. There were also a wide array of cooked dishes that was placed on the inner table. The Salmon in Apple Leek Sauce and Canneloni caught my attention. There also was the huge chunk of Prime Rib at the end of the table. At the 'bull's eye' table there was a beautiful display of the desserts, there were bountiful slices of small cakes and different kinds of sweet treats. I decided to skip the salad and go straight to the Japanese Station. I got a piece of Sushi, slices of Tuna and Salmon Sashimi, Eel and a small piece of Baby Octopus in Pepper Sauce. The Sushi tasted satisfactory, it could do better. The Sashimi was ok, it didn't have the stringy fish tendons though I wanted it fresher. My favorite was the Eel and Baby Octopus. Both the Eel and Baby Octopus were cooked and seasoned well. Next up was my plate of Cold Cuts. Everything on my plate was delicious, the Prawns and Mussels were plump and fresh, the Mango Shrimp cocktail wasn't clawing sweet and the Smoked Salmon had the smoky smell and flavor. Judging from how the Mussels look, these were not your typical local mussels, these are the huge imported variety. I decided to to get a slice of Tanigue or Spanish Mackerel and a piece of Lamb Chop. After a few minutes, the chef brought two beautifully grilled fish and meat. I was impressed that the Lamb Chop was automatically served with Mint Jelly. Both the fish and meat were grilled perfectly, the fish was moist and tender while the lamb chop still had a pinkish center. I went to the Pasta Station and ordered a plate of Fettucini Putanesca and a plate of Fusilinni Carbonara. Chef Tony Iannuccelli placed the neatly presented plates of pasta in front of me, we greeted each other and I got to ask a few things about the recently concluded Italian Feast in Bellevue last April. He told me that it was a success and that he is currently helping and teaching the secrets of Italian Cuisine to the chefs at Cafe D Asie. One thing that I often notice when it comes to 'buffet' pasta dishes, the pasta would be soggy and overcooked. Both the Fettucini and Fussilini still has a bite into it. What I really liked about the Carbonara was that they used thick-cut bacon on the sauce. But my favorite was the Fettucini Putanesca, it had too much sauce on it but the flavors was spot on. It wasn't your typical sweet Pinoy-style tomato sauce, it had the sour and slightly sweet flavors made from real good quality tomatoes. I finished the whole plate. While I was devouring my plate of Pasta Putanesca, Chef Tony came back holding a tray of Pizza. He got a slice and put it on top of my plate, he happily boasted that I should try his pizza. I happily obliged. I proceeded to ask him about the kind of tomatoes he uses in his dish. He told me that the tomatoes are all imported from Naples, Italy. I was looking at the Pizza, there wasn't much topping on it but the crust has the burnt marks at the bottom and it looked crunchy. As I held it up, the whole slice kind of droops forward. All signs were pointing to a great tasting pizza and indeed it tasted great. The crust was crunchy outside but the center was was soft and chewy, just how pizza crusts should be. As I asked Chef Tony for my second slice, he explained that he deliberately didn't add too much toppings and cheese on the pizza because he wanted the guests to enjoy the crust. He added that a great pizza always start with the crust to which I definitely agree. He also added if guests wants more toppings or cheese on their pizza, he would happily specially make one for them. From the Dumpling and Dimsum station I got a piece of Siomai, Hakaw or Shrimp Dumplind and Spareribs. Every dimsum treat tasted how its supposed to be. I felt that the Hakaw was over steamed, the skin was already too soggy. I hope next time they would check and take out the dimsum baskets out of the steamer to prevent over cooking. Two of the things that people love to eat in Buffets are the Tempura and Prime Rib or Roast Beef. What I really liked about Cafe D' Asie's shrimp tempura was it wasn't fried with too much batter. It was lightly coated to make you taste more of the shrimp rather than the batter. The Squid Tempura was also nice, the squid was cooked right, it wasn't rubbery and dry. I rarely go for the Roast Beef in buffet spreads, most of the time the beef would be dry and flavorless. Chef Martin insisted that I should try the Prime Rib, I agreed and told him to give me a small slice.W hile he was carving a piece from the huge chunk of meat, I saw how the meat's juices were just oozing off it. The slice of beef with a pinkish center was so good. It was moist, tender and flavorful. I was going around the cooked dishes and got myself servings of the Canneloni, Shrimps in Curry Sauce, Salmon in Apple Leek Sauce and Herb Potatoes. The Canneloni was so rich and flavorful, it wasn't a surprised when I found out that Chef Tony made this. The Shrimps in Curry Sauce tasted like Thai green curry which I really liked. The Salmon in Apple Leek Sauce was a delight, the salmon was cooked to perfection and I liked how the apple flavor was incorporated to the sauce. One of the first dishes that Chef Martin insisted that I should try was the Braised Leg of Lamb in Tomato Sauce. Even before I got to get the dish, Chef Martin sent over a plate to my table. I'm so glad that he did because the lamb dish was divine. It was packed with so much flavor and moreover the lamb was so tender that I didn't even have to use my knife to cut it into small pieces. As for desserts, I was too full to try them all and I have mentioned in my previous blog that I'm really not a dessert person. But still I got to try some of the little cakes and sweet delights from the dessert station. 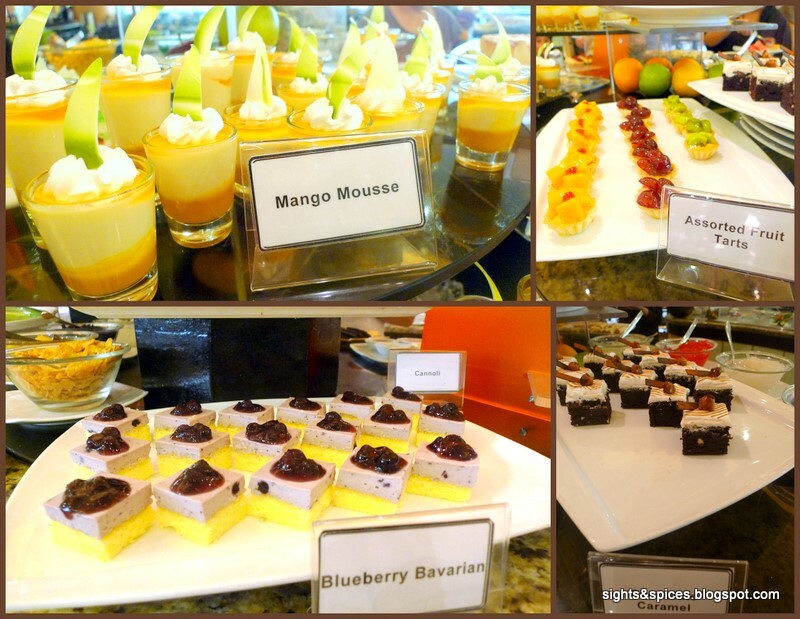 I'm quite sure that Cafe D Asie's beautiful sweet treats would satisfy the craving of guests with a sweet-tooth. After lunch, I contemplated and compared my previous experience before from what I just had. This time around it left a great impression on me, the food and quality has exceedingly improved and the service was impeccable. Nowadays, most good quality hotel buffets would cost more than 2K but the best thing about dining at Cafe D Asie is that it only cost Php1,390 net per person. Will I dine here again? Definitely! As Mr. Eichenauer said Cafe D Asie will still improve and offer more in the future. I'll be looking forward to my next meal here. 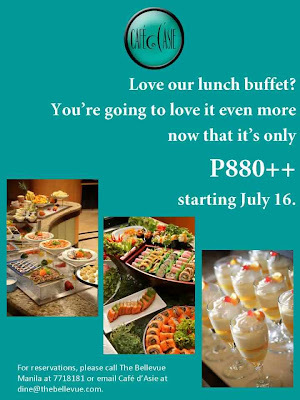 Afternote: I got an email from The Bellevue recently telling me that starting July 16, 2012 the new price for the lunch buffet is now only Php880++. They assured me that they'll still serve a wide spread of scrumptious dishes and the quality of the food will still remain of high standards. Now that's what I call getting a bang for your buck. Now that's a real feast, awesome spread!